Even though the official day of summer has yet to arrive.. I felt the need to make a change to the mantel. My hubby swears I contributed greatly to his retirement and most likely his child’s college education! …..I have been taking advantage of their great inventory closing sales. 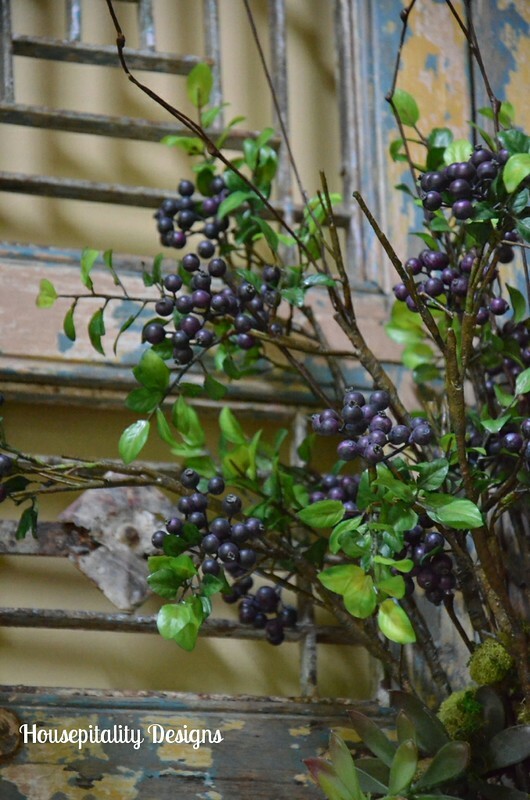 …..they had some blueberry stems left…..so I purchased them and they have found a home on the mantel. 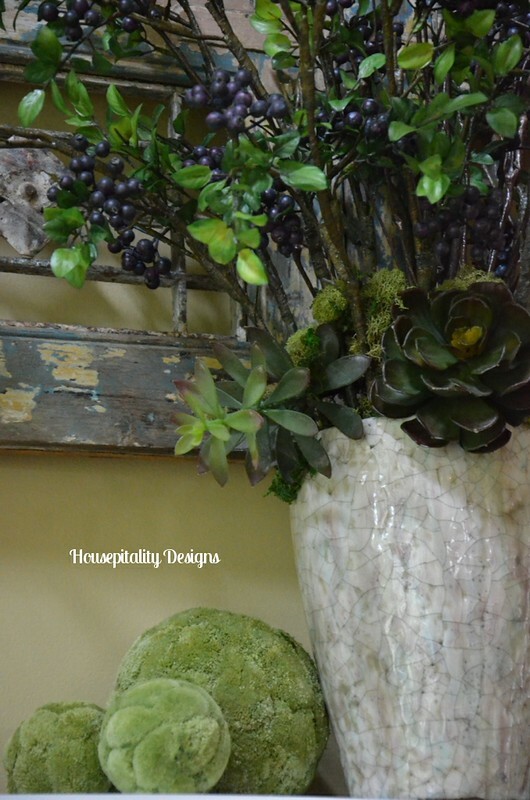 I added faux sedums to the base of the arrangement…. And the personnel there that I have come to know over the years….some actually became friends. ………..where we picked wild blueberries for our morning pancakes….they were the best pancakes! And these beauties landed on the hearth where the candlesticks were…. 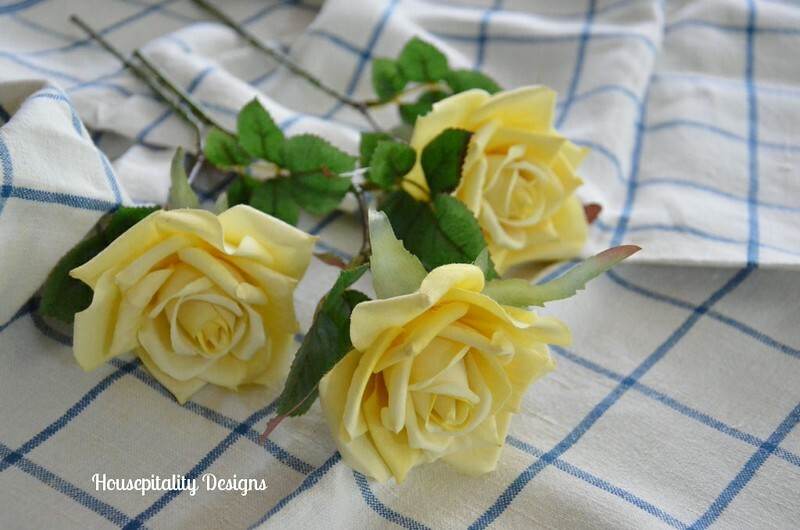 I purchased these finials at the same garden center…..on clearance. 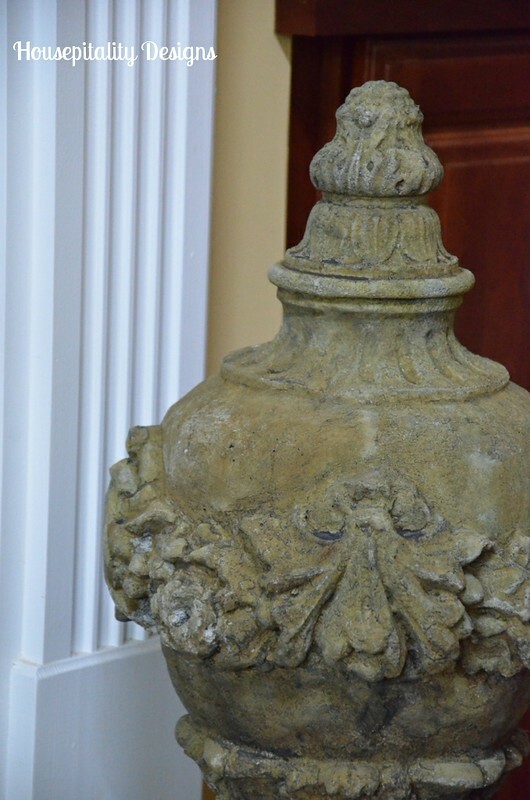 They are solid concrete and so very heavy!…They were initially placed on the front porch…. They were too pretty to be outside…to not enjoy them all of the time…. Did I tell you that I love those finials there…??!! …..My hubby said that I better like them there as they were a bear to carry … as they weigh a ton..
And a little trim…..stay tuned!! everything is just beautiful, Shirley! I think the concrete finials are my favorite additions. Gosh, I can’t wait to see your bedroom too. Your ceiling is one of the most gorgeous I have ever seen. Looking good! Your granddaughter can come visit me anytime! She’s growing up! P.S. Tell your granddaughter she is the prettiest part of your post! I love the blueberries and the new concrete finials! But I ESPECIALLY love the color of your ceiling! It’s gorgeous! Can you share what you used? Oh, Shirley! It’s most gorgeous! I love your beautiful home and everything you do to it is just superb! Have fun with your little sweetie. She’s adorable. You do have an eye when it comes to finding the just right thing. 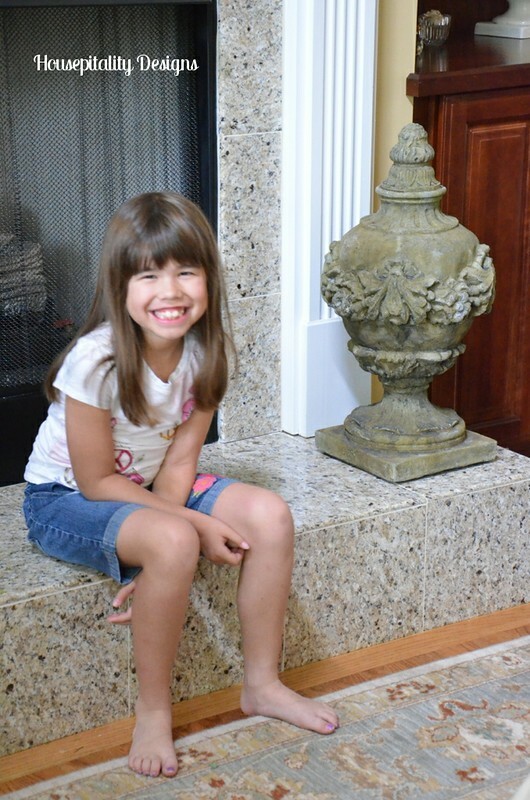 As pretty as all is, the best is your granddaughter who is always so willing to smile for you. 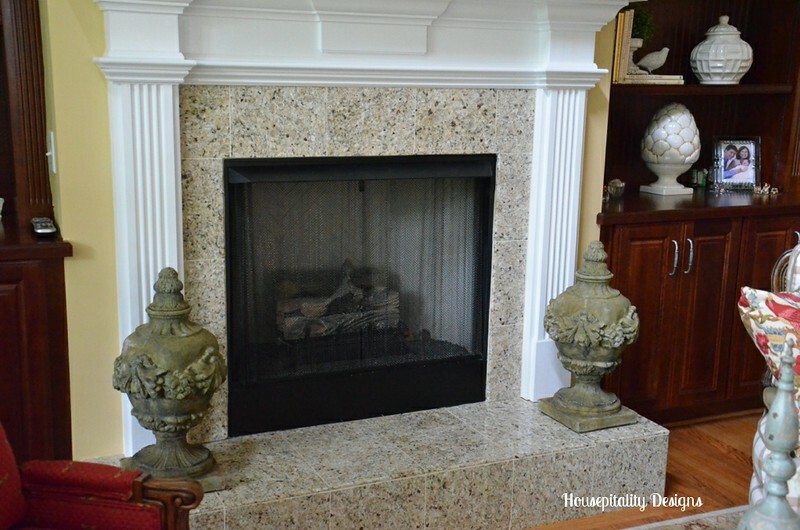 You have one of the prettiest mantels that I have ever seen. I just love it. Those faux blueberries are wonderful there. Can’t wait to see what you have done to your bedroom. I just love seeing what you do with your home. What a cute granddaughter! 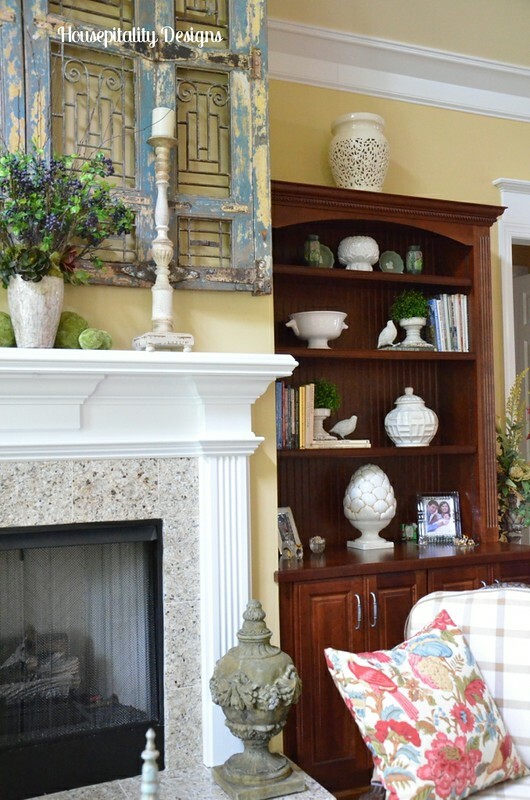 Love the mantle it is so simple and pretty. The fauxs you bought are so realistic looking I can see why you will miss this store. I pinned a picture of your finial. They are gorgeous. I am so excited to see the bedroom, which I know will be beautiful! Hopefully I will be posting an update this week about the house. This seems to never end! I just love your greatroom. 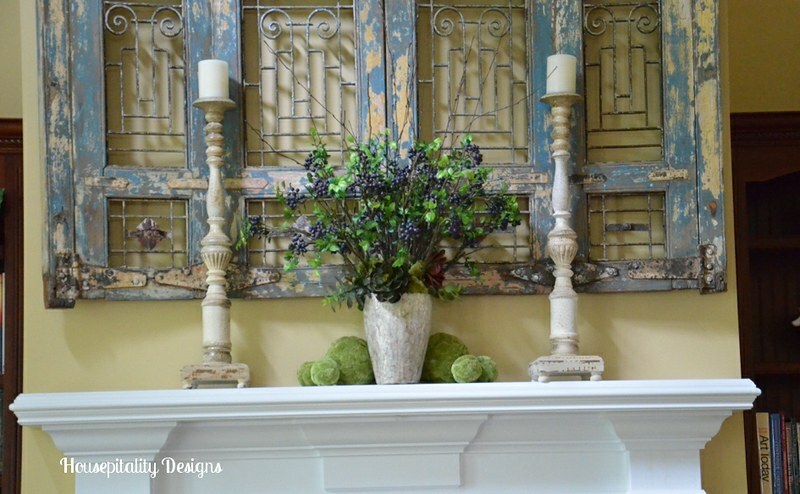 The large blue piece over your mantel is so perfect. 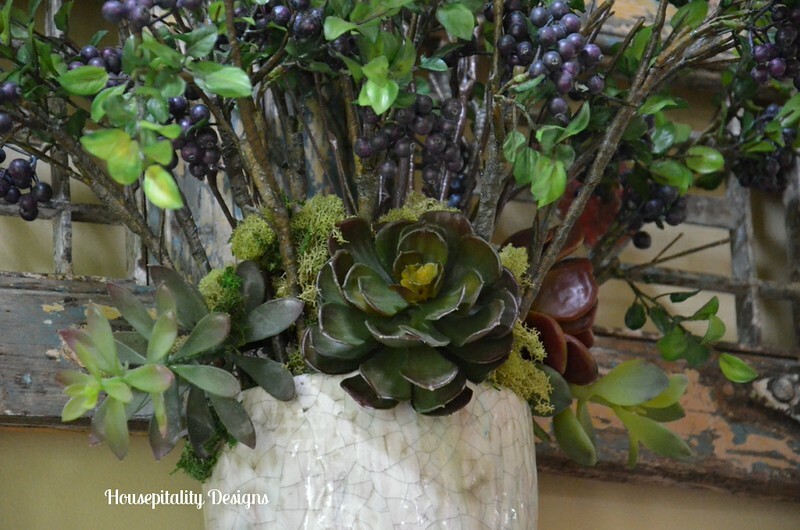 I love the new arrangement with the blueberry branches and candlesticks too. I wish I had those candlesticks! I know you will miss that garden center. They really had some beautiful things. I hate it when fun shops go out of business or close down for whatever reason. I always feel a personal loss about it too. 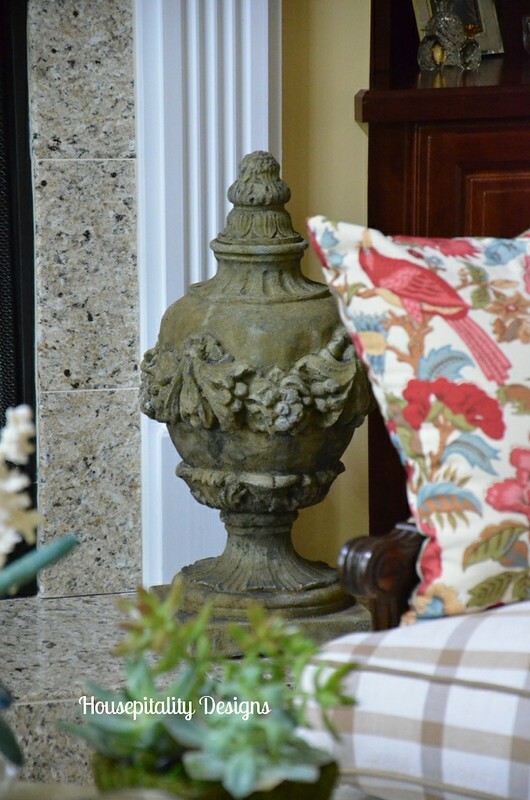 Your finials are perfect on your hearth too. I love garden statuary like that. Looking forward to seeing the changes in your bedroom. Looks pretty so far! 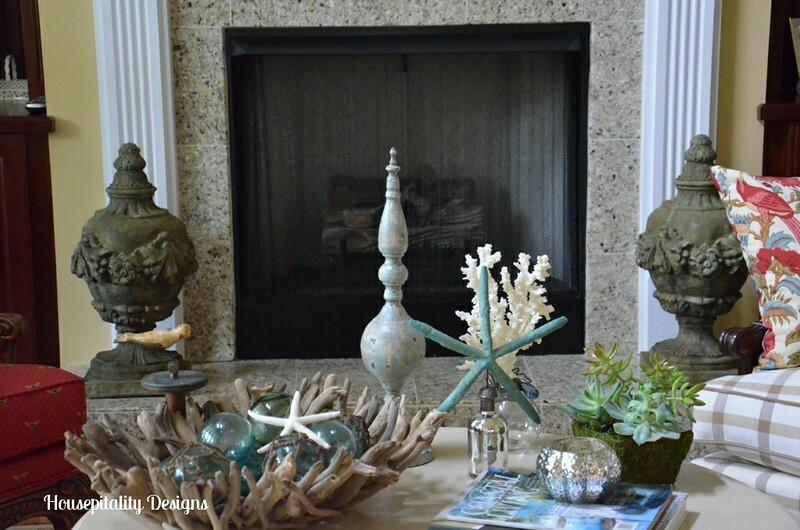 Your mantle is the perfect way to welcome Summer. I love those finials but as soon as I saw them I had a feeling they were heavy. Your sweetie sitting on the hearth makes it perfect. Can’t wait to see your bedroom. Your ceiling is to die for. I love those finials. The candlesticks look good on the mantel. They are tall and draw the eye up. Great changes. Great finds. Please e-mail the location. I would love to see if I could find something before it closes. 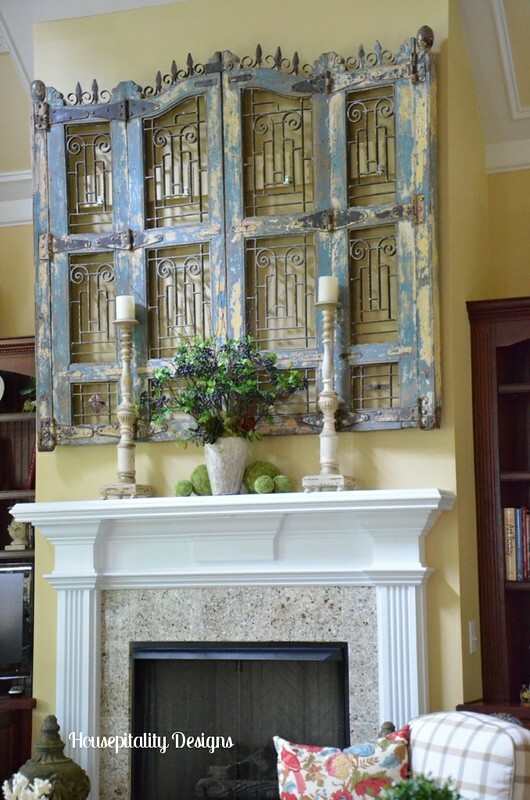 each time I see that mantel with the fabulous blue gate I swoon! Hi Shirley. Your granddaughter is adorable. 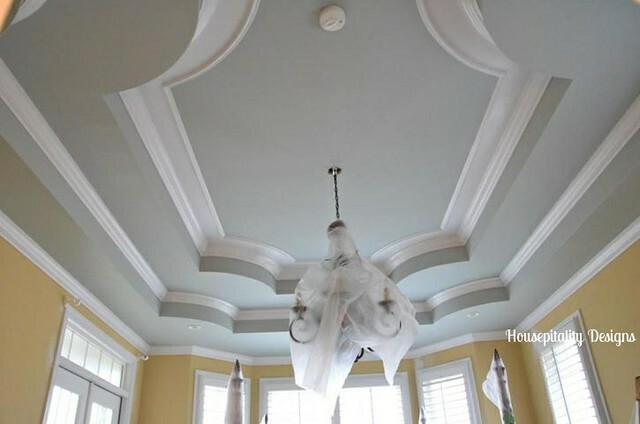 Your mantel looks great and what an awesome ceiling in your bedroom. 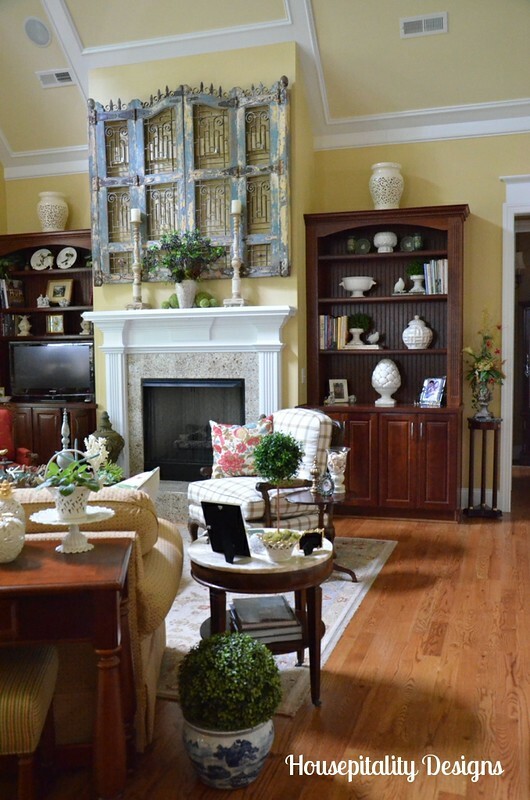 Your mantel is lovely- just the right touch of summer! Your granddaughter is precious! Wow, she’s growing up fast! I can’t wait to see your bedroom; I love it so far! flowers add the perfect touch! Know you enjoy your granddaughter’s company, she’s beautiful! 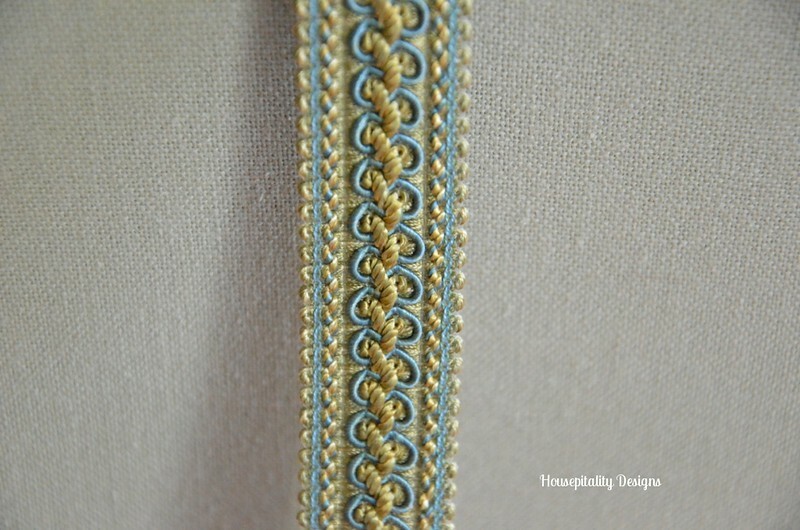 So pretty, Shirley, and perfectly simple for Summer. Can’t wait to see what you’re doing in your bedroom. So very pretty Shirley! :) Thanx for sharing at Treasure Hunt Thursday. Beautiful Shirley! So sorry to hear that one of your favorite stores is closing 🙁 Can’t wait to see your bedroom. Hello, this weekend is good designed for me, because this point in time i am reading this great informative paragraph here at my house.